This is a Japanese rendition of a Chinese Jian-ware tea bowl decorated with papercut designs of stylized plum blossoms. Jian-ware or jianzhan as the bowls were originally known, were made during the latter part of the Song Dynasty ((960-1279) and featured dark, shiny, iron-glazes that featured subtle patterning created by the iron in the glaze. Jianzhan tea bowls were made in several fanciful glazes which are known today as Hare’s Fur, Oil-Spot, Partridge Feathers, and Tortoiseshell. These glazes featured streaked coloration or mottled effects in blue, brown, black, and yellow-brown on lustrous dark glazes. In addition to these glaze patterns, fanciful papercut designs were created on the inside of these tea bowls using paper stencils that burned off during the firing, leaving tracings of delicate designs on light, buff-colored glaze on the inside of the tea bowl. Use of jianzhan tea bowls became popular in the Tienmu Temple located on Tienmu Shan located between China’s Zhejiang and Anhui Provinces (Mt. Tienmu in Chinese, Mt. Tenmoku in Japanese). Chinese monks used these bowls to drink tea and introduced this type of drinking bowl to visiting Japanese priest and monks during the latter part of the Song Dynasty ((960-1279). In Japan, these tea bowls were called Tenmoku tea bowls and potters today still try their hand at replicating the sophisticated style of these ancient tea bowls. 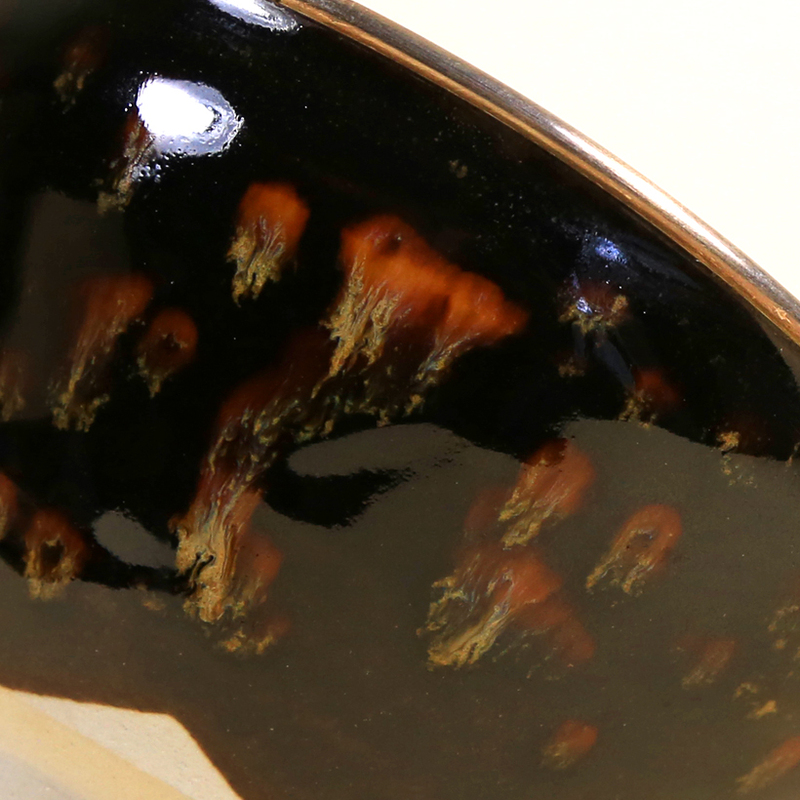 A hand-full of old, original Chinese tea bowls have been preserved in Japan. Now most of these existing bowls are priceless in value are kept as national treasures in prominent museums. 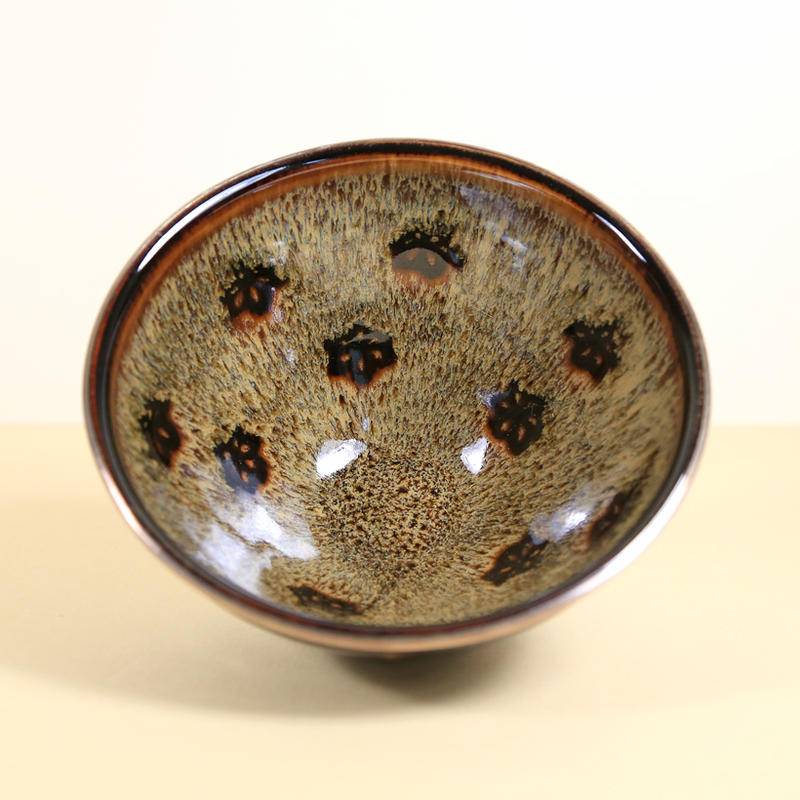 This Tenmoku tea bowl features tortoiseshell patterning on the outside of the bowl and the papercut designs of 10 individual stylized plum blossoms. At some point, someone, perhaps the potter, took great pride in this tea bowl and had a silver rim installed over the ceramic rim of the bowl to prevent chipping. 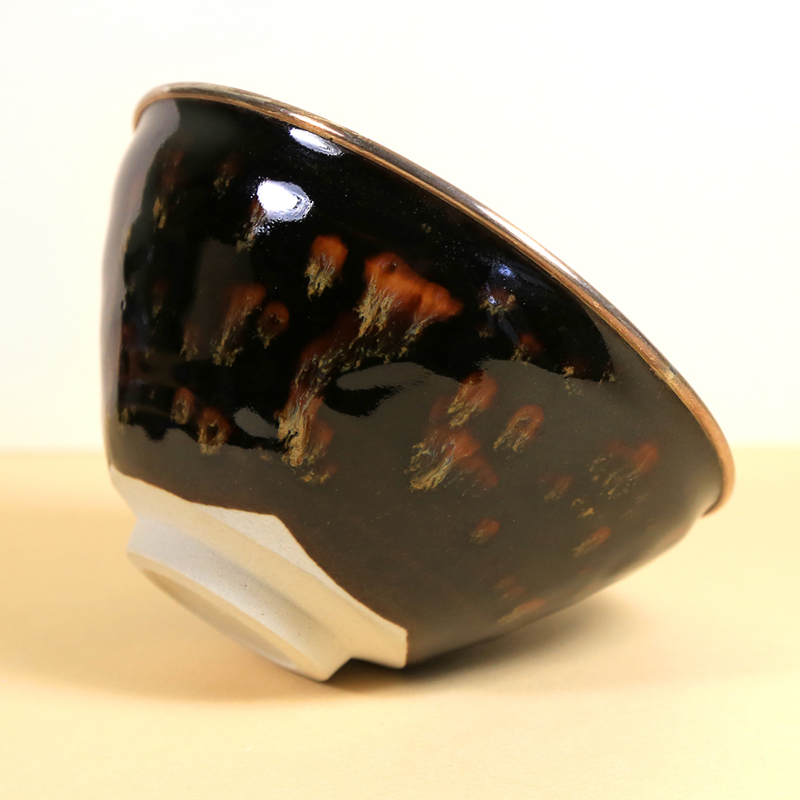 The silver rim is thin and shows up best in our photo of this tea bowl that is shown upside down. The silver rim is a nice addition for someone who wants to use the bowl. 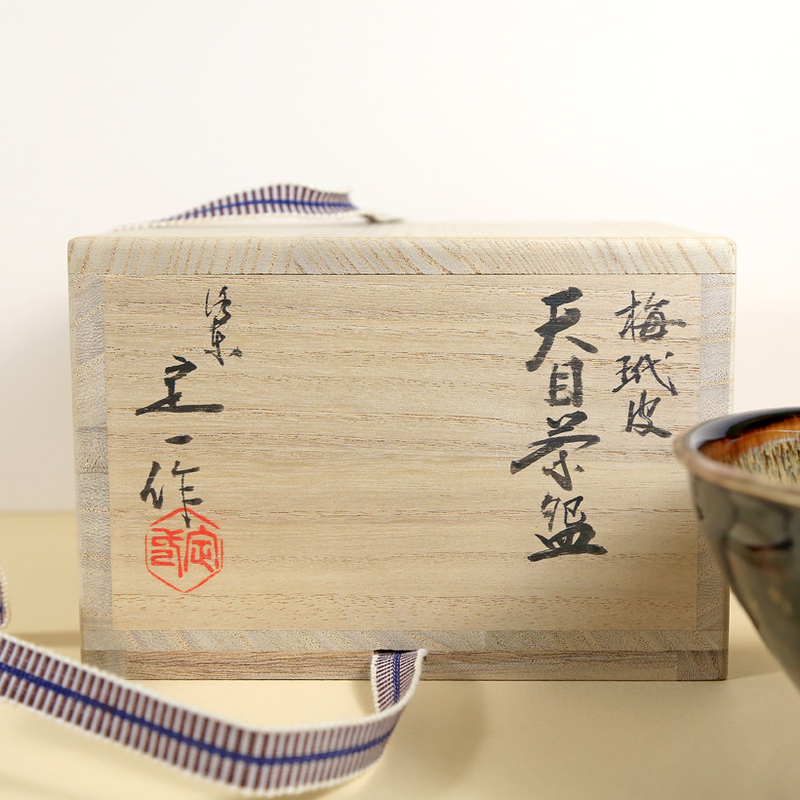 We often see silver rims on Tenmoku-style tea bowls both new and old. 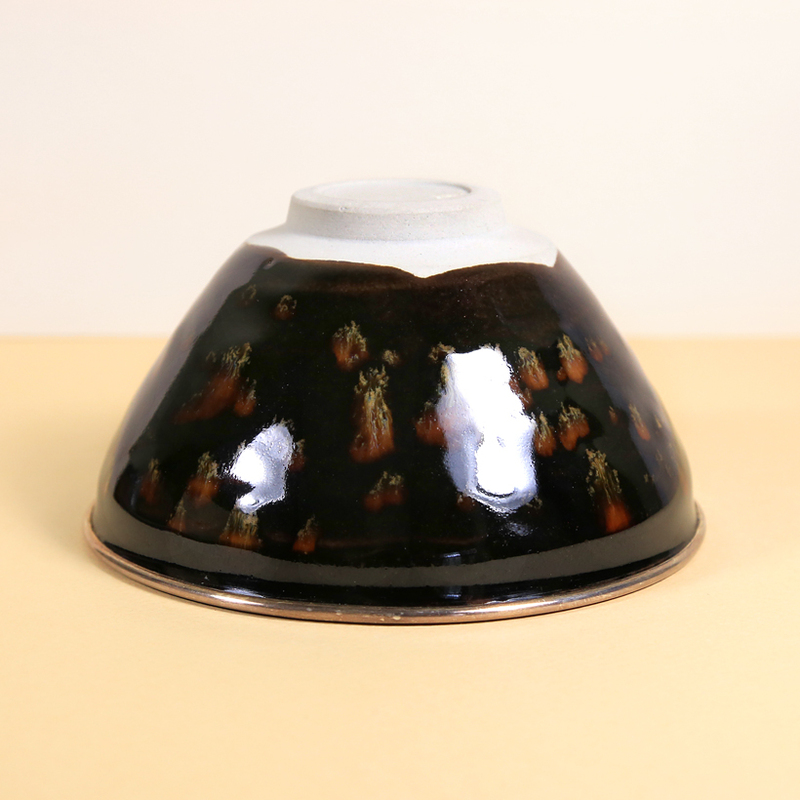 We think this addition is made to protect the rim as these bowls are wide and the rim could otherwise easily be chipped.